Buying a new toilet can be overwhelming. Beyond each toilet’s price tag and look, how can you be sure you’re buying the best one for your family? A good toilet will be with you for decades, so we at Mansfield Plumbing want to help you pick the perfect one by breaking down common toilet terms. These three letters represent one of the toilet’s most important features. 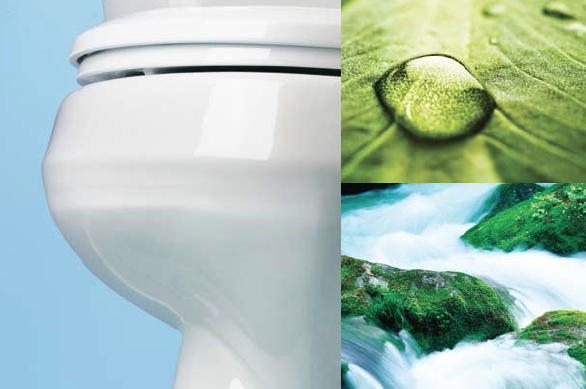 “GPF” stands for gallons per flush, and tells you how much water your toilet will use. The lower the “GPF,” the more water and money you’ll save. While purchasing a water-saving toilet is an option, you’ll also want to make sure it has a powerful flush so you never have to flush twice. Look at the toilet’s MaP Rating to identify how many grams of solid waste your toilet can flush. This rating is based on independent lab testing. The minimum performance standard is 250 and the maximum is 1,000. Dual-flush toilets come with two flush options: a button split into two that uses a higher gpf for solid waste, and a lower gpf for other flushes; the second option is a lever that is lifted up for liquid waste and pushed down for solid waste. For example, at Mansfield, one of our dual-flush toilets – the Enso – uses a button that flushes 1.1 gpf or 1.6 gpf based on your flushing needs. Before buying a new toilet, you’ll want to check the “rough-in” for your current one. The “rough-in” represents the distance between the wall and floor drain of the toilet. The standard rough-in is 12”. If you have an older home, your toilet may have a 10” or 14” rough-in. If a toilet is ADA Compliant, it meets the standards for toilet seat height for the American With Disabilities Act. The ADA standard is 17”-19” from floor to the top of the toilet seat. These two terms describe the shape of the toilet bowl. An elongated design is typically the most comfortable but may require a bit more space in your bathroom. If you’re buying a toilet for a smaller bathroom, consider a toilet with a round front. Most people have a two-piece toilet in their home with a separate tank and a base (two pieces). Another option is the one-piece toilet that functions the same, but is easier to clean and generally carries a higher price tag. We wish you happy toilet shopping! If you have any additional questions about choosing a toilet, please share them below.